The preparations for the Derby 10k 2017 are over and the race is run, as Team Eurocell raise money for East Midlands Air Ambulance. Pride Park Stadium, Derby. 9 April 2017. Rebecca Thompson, Assistant Product Category Manager, reporting. It was an early start and the weather was fresh with bright sunshine. The runners were ready and raring to go! I‘d like to be able to say they were ALL full of energy and excitement… though that would be a lie as at least 60% had a face full of dread, anxiety and apprehension, but credit where credit is due they were limbering up ready to run the Derby 10k and raise money for East Midlands Air Ambulance. As I gathered Team Eurocell together ready for a group photo I found myself giving a much-needed prep talk, ‘You are all superstars! !’ and ‘You can do this!’ … which was easy for me to say as I stood in my pregnant state, relaxed, comfortable and bossing them around. As I left them to mooch toward the start line, I wandered over with my camera in hand to find a suitable position to capture the painful moment’s, sorry, I mean proud moments as they ran past. There was a full mix of different abilities putting weeks of training to the test in a throng of 3500 runners. As the first Eurocell runner strode elegantly into view, I excitedly screamed and cheered ‘Jo Jo JOOOO!!! ‘She gave a quick wave and flashed a confident smile for the camera as she carried on with her journey. As time passed by more followed on. Steph, Dave and then - not to be missed in bright colours and matching hair - Scot and Ross. They all looked slightly tired by the half way mark but were running on confidence. As a spectator, I could see runners of all different levels their heads bobbing up and down, achieving their own goals in their own way. Some were running for the pleasure of it and some were running for more altruistic reasons. It was both heart-warming and inspirational to witness, the atmosphere buzzing as crowds cheered, every now and then getting louder and more energised with excitement as loved ones pass by. As I made my way to the finish line to greet the champion runners I felt both proud and nervous to see what sort of condition my colleagues may be in… Had Jo ran the time she was so desperately aiming for? Had Ross given it his all and achieved his biggest sporting achievement yet? Had Dave made it round alive without incurring serious injury?! Would Lee and Nik (one a lapsed runner, the other the ultimate newbie) even make it to the finish line or head to the nearest Starbucks? The answer was a resounding yes! One by one they all broke through the crowd. Faces GLOWING with smiles, exhaustion and relief – it was OVER, they DID it! To everybody’s surprise, not only did they all enjoy their run, they all vowed to sign up to do it again next year! And to top-off a perfect day the Eurocell team were awarded the highest funds raised for charity award. As of now the total sits at £2311 – which is STILL climbing, the total to be matched by the business. I think a VERY well done is due to all the Eurocell runners for such a great achievement. We are honoured to have raised money and awareness for such a deserving charity and look forward to future adventures to fund more life-saving flights. 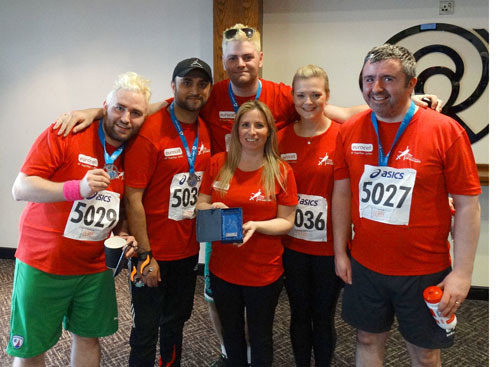 The Derby 10k took place on April 9th and all proceeds raised by Eurocell go directly to East Midlands Air Ambulance.